Eli Manning, like many other NFL quarterbacks, had his best statistical season last year. Finishing with nearly 5,000 yards, the two-time Super Bowl winning quarterback was able to make fantasy stars out of his top two receivers. One of those players was second-year undrafted receiver Victor Cruz, who came out of nowhere to finish 4th among wide receivers with 208 standard scoring fantasy points. His numbers, 1,536 receiving yards and 9 touchdowns, could easily be looked at as the best outside of only Calvin Johnson. The big question entering 2012 is whether or not Cruz’s season was a slight fluke. It’s not as though fantasy experts are writing Cruz off as irrelevant, but many believe that he has no chance of repeating what he did a year ago. History says, however, that he’ll still be a top guy. Eli Manning. This shouldn’t come as much of a surprise considering he’s a middle round quarterback, but I have reason to believe that Eli isn’t a worthwhile pick. 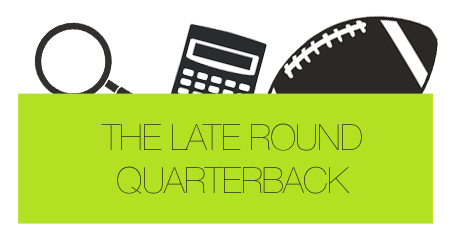 He’s been, on average, the 7th to 9th quarterback taken off the board in most drafts. It’s a fair position, considering he finished 6th at the position last year. But historically, Eli has been quite a disappointment from a fantasy perspective. He’s finished with a single digit rank just twice counting last season (2005 he was ranked 5th), and he’s typically in the 10th to 14th range. Again, I’ll ask you this: Do you want a low-end starter in the 6th round? The difference between Eli and anyone in the 10th-14th ranked quarterback collection will be minimal. Manning won’t be an elite quarterback. He’ll finish, at the highest, right after the elite players – like he did last year. Get running back and wide receiver depth before you decide to choose a player like Manning. Victor Cruz. I wrote about it before, but receivers that have had break out years while finishing in the top-5 at the position rarely become irrelevant for the rest of their career. The only player that has become obsolete since the turn of the century has been Braylon Edwards. Now, with that, I’m not saying that Cruz will repeat his numbers from 2011. That’s kind of an unfair thing to do, because, after all, he finished with the third most receiving yards in the NFL. People are devaluing Cruz because they believe he’ll start to get more defensive attention. Can that stop, please? In his final 6 games, Cruz finished with 4 100-plus yard receiving games. And I don’t think “100-plus” really shows his successes accurately. He had games totaling 128, 157, 119, 164 and 178 yards. You’d think that, entering the playoffs, teams would understand what this player is capable of doing, right? Well, in the playoffs, Cruz was able to amass 21 receptions for 269 yards and a touchdown in 4 games. No, it wasn’t nearly as impressive as his regular season numbers, but he did have 10 catches for 142 yards against one of the best defenses in the league in the NFC Championship game in San Francisco. The reason Cruz can’t always attract additional defenders is because of Hakeem Nicks. The former Tar Heel is physical, and is able to take on the burden of safety help. I like Cruz this year as, at least, a top-12 receiver. It wouldn’t surprise me one bit if he finishes in the top 6 or 7 at receiver. Ahmad Bradshaw. Currently leaving the board in the late 3rd and early 4th rounds in 12-team league, I believe Bradshaw has a lot of value. Let’s do a little comparison here. Ryan Mathews, the running back in San Diego, is being drafted in the first round of many drafts. People believe that, without Mike Tolbert to steal carries and touchdowns from him, Mathews is due for a breakout season. And yet, Ahmad Bradshaw, being drafted 3 or 4 rounds after Mathews, has never been the primary goal line back either. We can blame 6’5’’ teammate Brandon Jacobs. But now, Bradshaw is in a Jacob-less backfield. “But Bradshaw is an injury risk,” you say. Really? He missed 4 games last year, and that includes the Super Bowl playoff run. Mathews missed 2. In 2010, Bradshaw missed none. Mathews missed 4. You don’t think Bradshaw can carry the 1st running back load? He did it in 2010, touching the ball 276 times. He played in all 16 games that year, finishing just two points behind Maurice Jones-Drew in fantasy. Now, I’m not saying that I see Bradshaw as better than Mathews this season. Mathews definitely is more talented, and if healthy, will see more touches. What I’m pointing out is that we must use the same logic for everyone, and not make excuses for particular players. I see great value in Bradshaw this year, even with running back David Wilson breathing down his neck. Overlooked. While I’m not a big fan of Eli this year due to competition at quarterback throughout the league, I do see value in Victor Cruz and Ahmad Bradshaw. Cruz should finish as a WR1 in most leagues. Not necessarily a high-end one, though. And Bradshaw has an opportunity to become a high end RB2 if he’s able to stay healthy. That, and as long as David Wilson doesn’t get too far into the Giants’ running back mix. Watch the pre-season closely to see how Bradshaw’s feet look.